It just keeps getting worse as entertainment legends continue to die. I don’t want to write another one of these. On the heels of the deaths of Jack Klugman and Charles Durning comes word that Gerry Anderson — creator of SPACE: 1999, UFO, THUNDERBIRDS and so many more science fiction TV series — died Dec. 26 at age 83 after a battling Alzheimer’s disease. 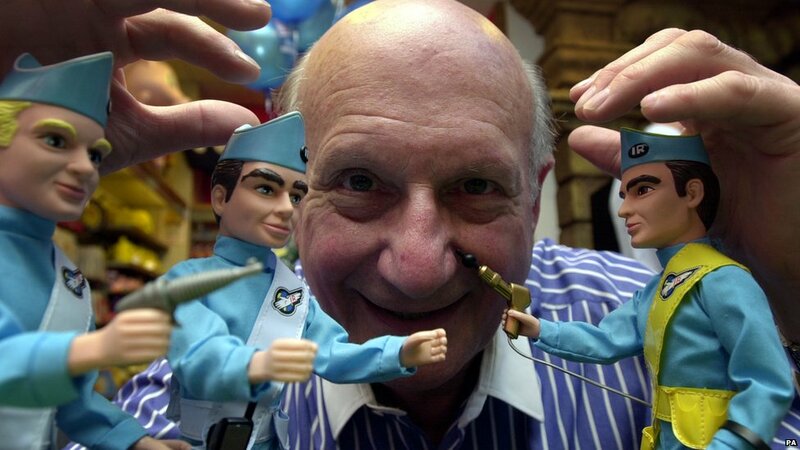 Anderson created the instantly recognizable Supermarionation process, using stiff, jerky puppets on strings to bring to life such shows as FIREBALL XL-5 and CAPTAIN SCARLET AND THE MYSTERONS. Anderson embraced the limits of his inanimate “actors” and made many of the storylines as outrageous as the puppets themselves. Somehow, the wacky stories made more sense with puppets; it was almost like winking at the audience. 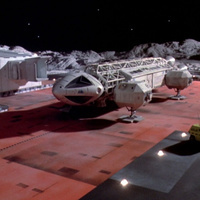 I can remember watching syndicated reruns of the live-action SPACE: 1999 as a kid. The premise of the show, that the moon is blasted out of Earth’s orbit and hurled into deep space with a science base full of Earthlings as unwilling passengers, really stoked the fires of my adolescent mind. I have clear memories of so many stiff and arch performances by stars Martin Landau and Barbara Bain (both of MISSION: IMPOSSIBLE fame) that they seemed almost to be portraying puppets in real life. The plots of many episodes were utterly forgettable or over-the-top, however, several were downright scary! I can remember have nightmares for months after watching “Dragon’s Domain,” in which an alien/monster eats its victims alive and spits out charred, smoking corpses. But the most enduring image in the public’s mind was probably the eagle spacecraft that enabled the denizens of Moonbase Alpha to do some exploring and contact alien civilizations. The spacecraft special effects were handled by a young Derek Meddings, who went on to work on such forgettable fare as five James Bond movies, Superman and Tim Burton’s Batman. UFO was Anderson’s previous series (and his first live-action show), and dealt with a special world agency called SHADO that protected Earth from periodic invasion by… well, UFOs. The alien ships looked like spinning silver triangles and emitted strange electronic sounds. I recall that the aliens themselves wore environment suits on Earth because they breathed a strange green liquid instead of air. In one episode, one of the heroes was “converted” to breathing the fluid. You may remember that the women on the Moonbase wore identical purple wigs as part of their uniforms. But the coolest part of UFO was the technology — specifically the alien-fighting machines. SID was a satellite in Earth orbit that warned of approaching UFOs. The Moonbase would dispatch Interceptors (armed with small nuclear missiles) to destroy the aliens. If any got past the Interceptors, then SkyDiver would be notified. This was the best vehicle ever: a submarine that launched a fighter plane into the sky from underwater! Finally, if worst came to worst, the ground-based Mobiles trundled along on caterpillar treads and could launch missiles. Sure, his programs may have been short on money and production values, and the acting might have been puppet-like throughout, but Anderson’s series showed a tremendous amount of imagination and dedication to the programs, and the that love and thoughtfulness was transferred to the audience, making it easy to suspend our disbelief and pretend marionettes really were defending the Earth, and an organization was out there, ready to protect us from alien threats in space, high in the air or deep under the seas. This entry was posted in Personal, Requiem, Science Fiction and tagged Fireball XL-5, Gerry Anderson, postaday2012, Space: 1999, Supermarionation, Thunderbirds, UFO. Bookmark the permalink.